Last week we enjoyed every minute of a much-needed mental break when we ventured out on a road trip to some of the more beautiful areas of the Northwest, relatively speaking in our own backyard. 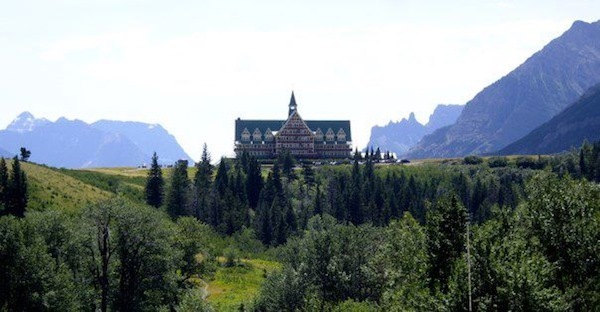 We braved the bears and camped every night under a full moon, staying in such places as Glacier National Park, Flathead Lake, and Sandpoint, Idaho. I really had no idea just how beautiful all these places were going to be, and I was not disappointed! One of the major goals of our trip, aside from getting away from our computers and anything that resembled work was, as you have probably guessed by now, to apprehend an assortment of our favorite berries—huckleberries, blackberries, and blueberries. We weren’t sure what would be in or out of season, but as it turns out, everything was late this year and synced perfectly, ripening just in time for our arrival. We even got in on the yummy cherry harvest at Flathead Lake! 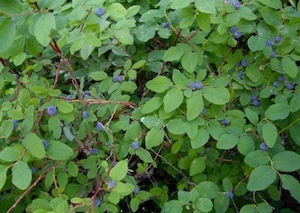 At $50 a gallon, it is hard to find the coveted huckleberries. Not only that, it takes an army of folks a whole day to get enough to make a pie. One person even told us in a restaurant that one huckleberry pie would cost $35, which is why they don’t make it and serve it for diners! They are small and hard to come by, but they are sure worth it! The flavor is absolutely delicious. 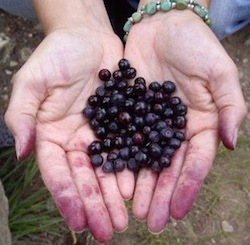 With this our first-ever serious huckleberry-picking trip, we didn’t know how to go about finding them, so we started asking folks as soon as we got to Libby, Montana. The first place was in a gas station. As soon as I said, “huckleberries,” the two ladies standing at the counter practically glared at me and said, “They aren’t ready yet this year.” When I pressed them as to the location one might find them if they were, they asked which direction we had come from and both agreed that the only huckleberries were 20 miles back the way we came. I was skeptical. 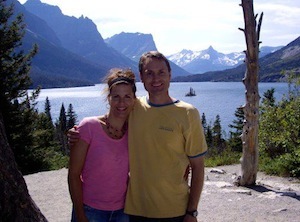 We tried our luck again at Flathead Lake and were told there are no huckleberries at Flathead lake, but only up in Glacier Park…the way we had just come. We tried our luck again at a campground in Sandpoint. Again, as soon as I mentioned huckleberries to the camp hosts, they started shifting their eyes at each other and the husband said, a little too enthusiastically, “This is a BAD year for huckleberries—too cool and too much moisture. You won’t find enough to make it worth your while.” No matter how we pressed, he got out of naming any specific locations. We were getting really suspicious. It seemed obvious that these locals did not want outsiders helping themselves to the sought-after berries. Hard work to pick, but o so fun to eat! stood over the scene, watching us ask him to keep looking for the map and…what a coincidence, it was right there in front of him in a box—a very large box full of oversized huckleberry maps (easy to miss)! But again, he steered us to an area on the map and said our best bet would be this, ahem, certain area. We decided to nix his advice and picked a completely different area that looked more promising. And, well, the rest is history. We brought home a couple gallons of beautiful, juicy, sweet huckleberries! Julie, I did the same thing around ’91 in the fall. 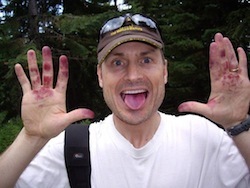 Picked huckleberries somewhere around Glacier National Park on a path literally padded with bear fur.